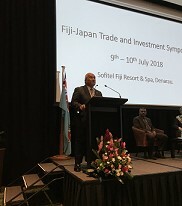 A two-day Fiji-Japan Trade and Investment Symposium was held at the Sofitel Fiji Resort & Spa in Denarau on the 9th and 10th of July, 2018. 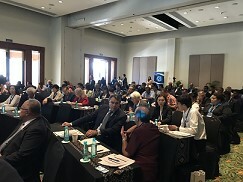 The symposium was co-hosted by the Embassy of the Republic of Fiji in Tokyo, the Ministry of Foreign Affairs of Fiji, the Ministry of Industry, Trade and Tourism Fiji and Investment Fiji. This well attended event received 134 people from government officials of both Fiji and Japan, as well as private sectors. 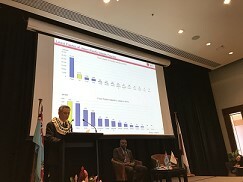 The symposium was held in cooperation with the Government of Japan, in particular of the Ministry of Land, Infrastructure, Transport and Tourism (MLIT), the Embassy of Japan in Fiji, Japan External Trade Organization (JETRO), United Nations Industrial Development Organization (UNIDO), the Tokyo Chamber of Commerce and Industry and Pacific Islands Centre (PIC). The PIC Deputy Director also attended this symposium and had a valuable experience obtaining local up-to-date information. An outline of the two-day symposium is given as below. The symposium began with welcome remarks from H.E. 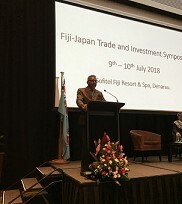 Mr. Isikeli Mataitoga, Ambassador Extraordinary and Plenipotentiary of Embassy of the Republic of Fiji in Japan, followed by an address by the guest of honor, Hon. Mr. Faiyaz Koya and Hon. Mr. Katsunori Takahashi, Vice-Minister of Land, Infrastructure, Transport and Tourism. Following the opening ceremony, a presentation highlighting insights in trade and investment was delivered by Fijian government representatives and private sectors. Business networking, exchange and gathering of information.